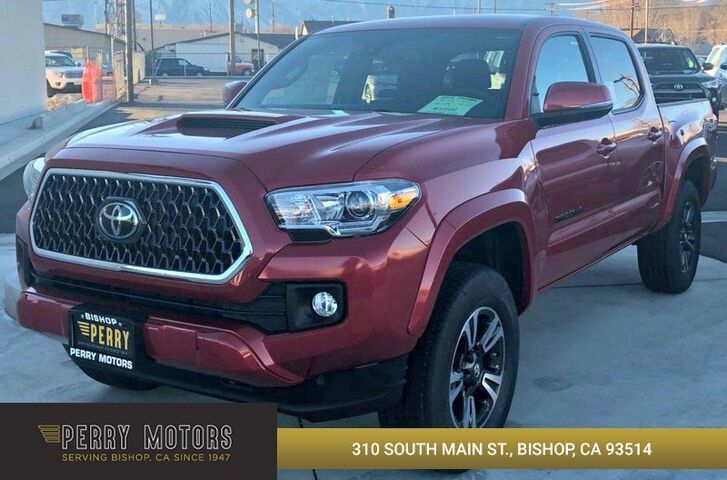 This 2019 Toyota Tacoma 4WD 2019 TOYOTA TACOMA TRD SPORT V6 (A6) DOUBLE CAB 4D is proudly offered by Perry Motors This Toyota includes: BLACKOUT EMBLEM OVERLAYS (PPO) 50 STATE EMISSIONS TECHNOLOGY PACKAGE Rear Parking Aid Blind Spot Monitor Cross-Traffic Alert BED MAT (PPO) BLACK CHROME EXHAUST TIP (PPO) TRD SPORT PACKAGE (PY) Smart Device Integration ALL WEATHER FLOOR LINER Floor Mats TRUCK BED D-RINGS (PPO) *Note - For third party subscriptions or services, please contact the dealer for more information. * Taking the road less traveled has never been more fun than with this 4WD. With improved performance, mileage and acceleration, this 2019 4WD Toyota Tacoma 4WD 2019 TOYOTA TACOMA TRD SPORT V6 (A6) DOUBLE CAB 4D is king of the off-road. Beautiful color combination with Barcelona Red Metallic exterior over FD15/GRAPHITE W/ GUN META interior making this the one to own! The look is unmistakably Toyota, the smooth contours and cutting-edge technology of this Toyota Tacoma 4WD 2019 TOYOTA TACOMA TRD SPORT V6 (A6) DOUBLE CAB 4D will definitely turn heads.